Kheer is an Indian rice pudding dish that is simple, yet so creamy and delicious. It traditionally consists of basmati rice, whole milk and sweet, warming spices such as saffron, cloves and cardamom. This modified version utilizes similar ingredients, except the basmati rice has been replaced with some wholesome, wholegrain quinoa and some extra spices such as cinnamon, ginger, turmeric and nutmeg have been included. This adds a bit more flavor and a lot more phytonutrients including antioxidants, protein, fiber, B vitamins, zinc and magnesium. This dish is perfect for the fall and winter seasons as it is grounding, nourishing, slightly sweet and very soothing on a cold day. 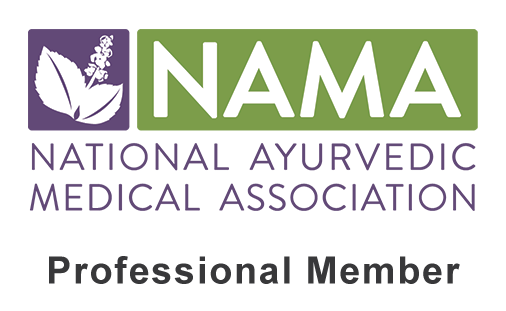 It is great for reducing Vata dosha and increasing vital Ojas (immunity, vitality, energy) in the system. Although it is best for Vata types, it is also beneficial for Pitta and can easily be made suitable for Kapha as well (see doshic modifications at the bottom of the page). I often enjoy this dish either as a wholesome snack or healthy dessert with great enjoyment (and no guilt!). It is perfect for times of low energy, pregnancy, postpartum, and after a cleanse to regain strength and energy. It is light enough to eat on a regular basis and tasty enough to avoid boredom (in my option). 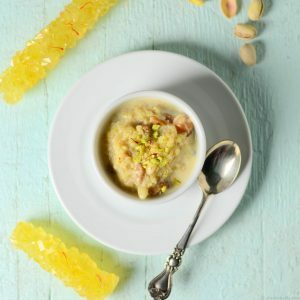 In fact, one can make this quinoa pudding as a base recipe and jazz it up with each serving by adding in some extras such as honey, maple syrup, cacao nibs, raisins, nuts, chopped dates or coconut depending on your taste buds’s desire at that particular moment. With the simplicity of this recipe, the high nutrient content and the delicious flavor you will soon be hooked like myself… So let’s get started!! 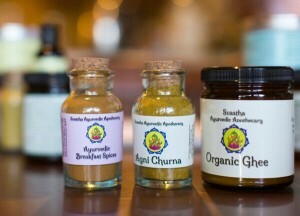 *The Ayurvedic Breakfast Spices can be replaced with a blend of ground cinnamon, ginger, cardamom, nutmeg, turmeric and cloves. 1. Place the water and milk in the large pot and heat on a high temperature until it is about to boil. 2. Reduce the heat to low/simmer and add in the quinoa, ghee, Breakfast Spices, cinnamon sticks, salt and saffron. Stir well until the spices are fully dissolved. 3. Cover leaving a slight crack in the lid and cook on a low/simmer heat for 40 minutes. Stir every 10-15 minutes. 4. At 40 minutes, check the consistency of the pudding. The quinoa should be very soft and well cooked. The dish itself should be soupy with a small amount of extra liquid. If it is overly soupy continue to simmer for 5-10 minutes, checking every minute or two. 5. Once the desired consistency has been reached, turn the heat off and cover the pot completely, leaving it on the warm burner. This will allow the extra juices to absorb and make it even more soft and creamy. 6. If you wish to add a bit more sweetness add in the honey to taste AFTER the pudding has cooled to about 100 degrees or so*. Serve in small dishes and garnish with a small sprinkle of cinnamon. *Honey should never be cooked or heated over 108 degrees. When heated the honey changes its molecular structure and becomes toxic and undigestible to the body. 7. Eat, sit, share and enjoy in good company! 1. Place the desired amount of quinoa pudding in a small sauce pan. Add in a generous splash of milk (or small amount of water for Kapha types). Stir well. 2. Turn the heat on to a low/simmer setting and cover. Heat here for 7-10 minutes, stirring every 2-3 minutes. 3. Add in any extras if desired after the heating is complete. NOTE: This recipe will stay good for up to 5 days in the refrigerator, although each serving should only be reheated once. This recipe is great as is for Vata types and during times of Vata imbalances. It is beneficial for strengthening the body, reducing dryness, alleviating constipation, boosting energy levels and increasing immunity. Due to its warm, well-cooked, soupy nature this recipe is easy-to-digest and should not upset Vata digestive issues such as gas and bloating. Overall this recipe is beneficial for Pitta types, although the spices may be a bit heating for some. In this case, one should cut the amount of spices in half and 1/4 cup of rose water should be added (if available). Otherwise enjoy as is! This recipe can be a bit heavy for Kapha due to the dairy involved. In this case, one should replace the cow dairy with a nut milk, seed milk or goat milk. It is also recommended to reduce the amount of milk to three cups while increasing the water to seven cups. The ghee should be omitted altogether. The spices should be doubled to help lighten this recipe and aid in digestion. Honey is the best sweetener for Kapha, but should be used sparingly. If extra additions are added, the best options would be cacao nibs, chia seeds, freshly ground flax seeds, hemp seeds or chopped pumpkin seeds. The other suggested additions listed above should be avoided (sorry! ).